Thought i’d start a thread for those fans of zee German league. Bayern issue was availability though wasn’t it? Pretty sure he was the only manager they could get at the time, pretty much a last resort. This is the first time I’ve had BeIn so I’ve been catching a bit of the Bundesliga. I don’t know what I was expecting but the standard has kind of let me down. It’s like a PL lite, helter skelter interspersed with moments of quality. It’s exciting to watch but I find that there are a lot of basic errors in the defensive 3rd that result in goals rather than the breaking down of defences through ball play. Dortmund appear to be the exception to this and Jadon Sancho looks to be a real baller. 36kph top speed on the weekend as well! Paco Alcacer does it again. At this rate he’ll win the Ballon d’or without starting a game. 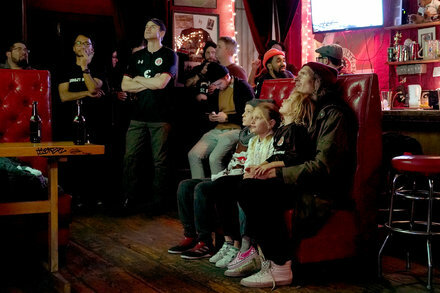 The curious case of a bike-messengers’ dive bar that is devoted to F.C. St. Pauli, a minor-league club from Hamburg.